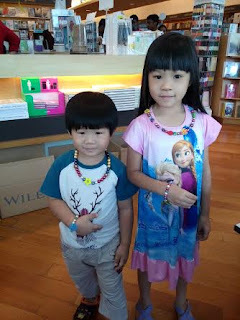 On 28th of June 2015, my children had a lot of fun learning how to make jewelley at the upper floor of Kinokuniya bookstore, KLCC. This was a class held by Elegant Jewellery Studio which was established in 2013. 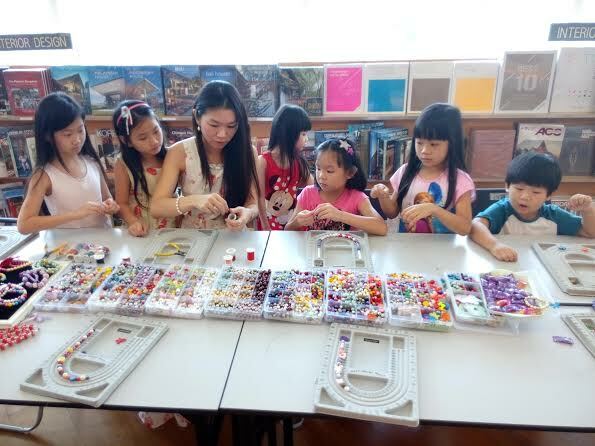 The class was taught by Ms. Angie Ng, the founder of Elegant Jewellery Studio. She is very talented and loves to teach. She encourages students to create their own unique design. Each child made a necklace with 2 wired balls and a bracelet. It's quite easy to make, even my son can make it. My kids with their beautiful jewellery design. Here is a group photo of Ms. Angie and the kids. Thanks to Elegant Jewellery Studio and Sydney Kan for the invitation. My kids really had a fun time learning the art of jewellery making.